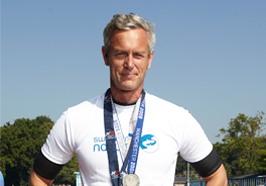 Eight-times World Record holder Mark Foster explains the physical benefits of swimming. If you’ve ever wondered what muscles you work when you swim, or what happens to your body as you race through the water, read on to get up to speed on the impact of this super-sport. There’s no denying swimming is a seriously energetic sport. It uses just about every muscle in your body and increases your aerobic fitness, too. Even better, it burns energy while supporting your joints making it a great way to get in shape. Yet despite all these benefits according to the Amateur Swimming Association, a staggering 50% of 7 to 11 year olds can’t swim the length of a 25m pool and as many as 9 million adults in the UK can’t swim at all. Naturally, I’m all for swimming and it’s great to know that despite these figures, 2.13 million Brits are keen to learn to swim. But I’m not sure everyone knows just how good swimming can be for your health and fitness. So here’s a breakdown of exactly what happens to your body when you go swimming. What muscles will I work when I go swimming? Front Crawl is the stroke for speed – it moves you fast through the water and generates the most force. When you’re using front crawl, your arms are pushing and pulling underwater, your torso is working hard to keep you steady and rotating to give you a longer stroke. Your hip flexors (at the top of your thighs) are engaged too, to maintain a steady kick. Less intensive than front crawl, backstroke is a great recovery option. As the name suggests, it works your back. Your lats are engaged – that’s the wide muscle on either side of your back, beneath your shoulder blade. This muscle is pulling your arm under the water and then back to the surface again. In addition, your hamstrings (back of your thigh) and glutes (bum muscles) are engaged to propel you through the water. Synchronisation is key here – having the arms in time with the legs. This stroke will work all your muscle groups equally. Your shoulders are working hard to move your arms from behind to in front of you. The chest and your lats then work together lift your chest out of the water as you take a breath. Your legs are doing a frog kick that’s similar to leaping off the floor from a squat, working your glutes, quads (front of thigh), hamstring (back of thigh) and your calves, too. Butterfly is a super-powerful stroke that will build strength and boost your metabolism. Both arms move simultaneously, working your shoulders, lats and arms. Your core and lower back muscles go into overdrive to stabilise your core in the water and lift your body out of the water, and your glutes ensure your legs move as one, like a dolphin. Phew! It’s energising just thinking about it. As far as an all-over body workout goes, it doesn’t get much better. Add to that increased lung capacity from taking huge breaths frequently and precisely, and swimming helps to improve your aerobic performance, too. If you’re keen to get in shape by swimming, Swimming Nature offers premium tuition and fast results. Our award-winning technology and bespoke programmes ensure you and your kids develop precision techniques and complete mastery of the water. Whether you’re looking for yourself or your kids, we cater for all abilities from beginners to triathletes, and our exclusive Mark Foster Programme takes advanced swimmers to the next level. For more information, explore our programmes today.